8 hours Don't Climb Onto the $80+ Oil Price Greed Roller Coaster, Please. 2 hours How many drilling sites are left in the Permian? 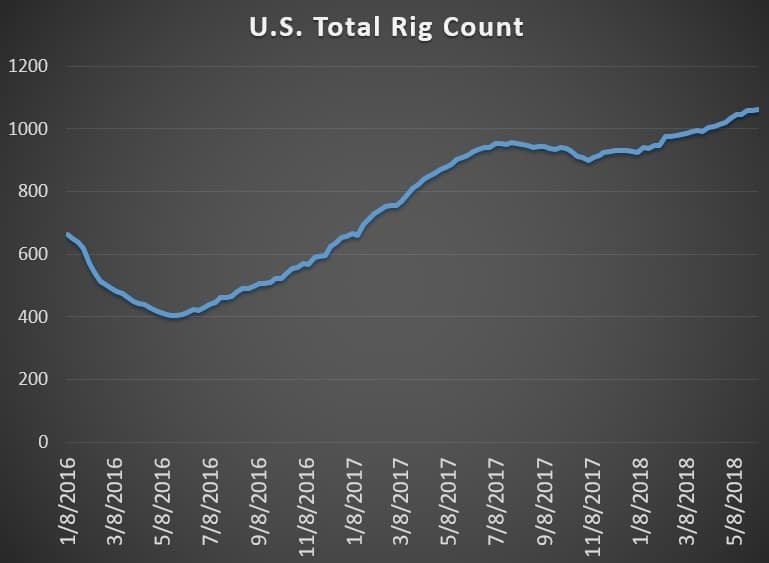 2 hours "Undeniable" Shale Slowdown? Tom majored in International Business at Amsterdam’s Higher School of Economics, he is now working as news editor for Oilprice.com. Oil markets largely ignored the much-anticipated meeting between U.S. President Donald Trump and North Korean leader Kim Jong Un, though further geopolitical maneuvers should weigh on crude prices moving forward. 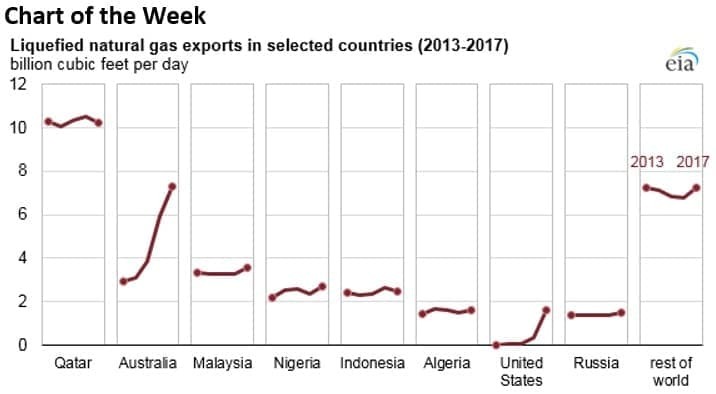 - LNG exports have increased sharply around the world, after the inauguration of a series of export terminals in the past five years. - Global trade in LNG rose to 38.2 billion cubic feet per day (Bcf/d) in 2017, a 10 percent increase from the year before. It was also the largest annual increase on record at 3.5 Bcf/d. - The gains were led by the U.S. and Australia, two countries that have seen a wave of investment in LNG export projects. • Anadarko Petroleum (NYSE: APC) said it was monitoring the security situation in northern Mozambique near its Rovuma Basin gas project. Attacks by Islamic militants led to an advisory by the U.S. embassy, telling Americans to leave the area. • Apache Corp. (NYSE: APA) saw its share price jump more than 6 percent on Monday after Argus upgraded its shares to Buy from Hold, with a $56 price target. • ExxonMobil (NYSE: XOM) is reportedly building up its trading unit. The oil major “is pushing deeper into energy trading, building a global cadre of experienced traders and beefing up risk-management systems to lift profit,” according to Reuters. The markets shrugged at the historic meeting between President Trump and North Korean dictator Kim Jong Un. Both sides hailed the summit as a breakthrough, with a pledge towards denuclearization, but as expected, there was a lack of even the most basic details on how they might get there. Oil was flat at the start of Tuesday. Iraq opposes output increase. Opposition to an increase in the OPEC/non-OPEC production limits continues to grow, with Iraq coming out against such a move. OPEC’s second largest producer said that the production cuts have not yet achieved the intended objective of balancing the oil market. “Producers from within and outside OPEC have not yet reached the goals set,” Iraq’s oil minister Jabbar al-Luaibi said in a statement. Iraq “rejects unilateral decisions made by some producers which do not consult with the rest.” He went on to add: “We shouldn’t exaggerate the need of the oil market for more oil at the present time, and which could cause great damage to global markets.” The statement of opposition comes after Iran and Venezuela also called upon the group to keep the limits in place. The open resistance from a growing number of OPEC members to what seems to be a likely outcome (a softening of the production curbs) is setting the stage for a contentious meeting. Related: Is Russia Bailing On The OPEC Deal? Saudi Arabia and Russia increase production. Despite opposition from some OPEC members, the two most important producers, Saudi Arabia and Russia, are already signaling their intent to raise output. Saudi Arabia also added production last month, which, marking a significant change in strategy. OPEC’s secondary sources said Saudi Arabia increased production by 85,000 bpd in May while the Saudis themselves said production rose by 161,000 bpd. Russia also increased output at the beginning of June from 10.95 million barrels per day to 11.09 mb/d. The data suggests the two producers are laying the groundwork for higher output. Venezuela production plunges again. Venezuela told OPEC that it increased production in May by 28,000 bpd, but those communications tend to lack credibility. OPEC’s secondary sources say that Venezuelan output actually fell by 42,000 bpd, putting overall output at a new low of 1.392 mb/d, or roughly 750,000 bpd below 2016 levels. Dutch government proposes swifter cuts to Groningen gas production. The Netherlands said the Groningen gas field will produce less than 12 billion cubic meters per year by the end of 2020, and the government is planning on ceasing production altogether by 2030. The field, one of Europe’s largest, has been blamed for a rise in earthquakes. Renewables see more investment than fossil fuels. Global spending on renewable energy for electricity generation is exceeding that of all fossil fuels and nuclear power combined. According to the IEA, the world spent $297 billion on renewable energy in 2016 (the latest year for which complete data is available), which was more than twice the $143 billion spent on new nuclear, coal, gas and fuel oil power combined. Renewables will account for 56 percent of all new electricity capacity installed between now and 2025. Costs have declined so much that renewables are the cheapest option in many places. As of last year, about 12.1 percent of global electricity generation came from non-hydro renewables, double the share from a decade earlier. Large corporations worried about climate change. An analysis of 10 years’ worth of earnings calls by S&P Global Ratings found that “climate” and “weather” were frequently discussed, while words like “oil,” “Trump,” “the dollar” and “recession” received less attention. “The effect of climate risk and severe weather events on corporate earnings is meaningful,” S&P said in the joint report with Hamilton, Bermuda-based Resilience Economics Ltd.
Chevron, Occidental a “Buy,” Exxon and Conoco “Neutral.” Mizuho analyst Paul Sankey gave Buy ratings to Chevron (NYSE: CVX) and Occidental (NYSE: OXY), and said Chevron was in a “multi-year sweet spot” with lower capex and 6 percent annual production growth. ExxonMobil (NYSE: XOM) is in the opposite position, with production flat and the company entering a period in which it plans years of higher spending levels. Nigerian pipeline outage could cut into exports. The Nembe Creek Trunk Line, which carries Bonny Light crude in Nigeria, shut down last week for repairs. Bonny Light has been under force majeure for a month, and the outages could curtail Nigeria’s oil exports. According to Reuters, exports could fall from 1.79 mb/d in June to just 1.43 mb/d in July. Equinor: Oil demand to peak in 2030. Norwegian oil company Equinor (NYSE: EQNR), formerly Statoil, said that oil demand could peak around 2030 at about 111 mb/d. EVs and efficiency will offset rising demand in petrochemicals and aviation. Can Saudi Arabia Prevent The Next Oil Shock? Does Germany’s LNG Strategy Make Sense? It comes as no surprise that the global oil market shrugged at the historic meeting between President Trump and North Korean leader Kim Jong Un. While both sides hailed the summit as a breakthrough, with a pledge towards denuclearization, oil was not impressed. The reason is that the summit was a golden opportunity for the North Korean leader to bask in the international limelight having met the president of the United States on equal terms. President Trump might get some credit for de-escalating tension between his country and North Korea. But that is all. While Kim Jong Un pledged to work towards denuclearization, this in no way means that he will give up his nuclear weapons. He will drag the United States in negotiations for years while seeking the lifting of US sanctions against his country, secretly perfecting his nuclear arsenal and also getting massive financial aid from South Korea. The truth of the matter is that President Trump’s withdrawal from the nuclear deal has been an eye-opener for Kim Jung Un strengthening his instinct not to trust any future agreement with the United States and also not to relinquish any of his nuclear weapons. It is my view that Kim Jung Un will draw most of the benefits from the summit while President Trump will eventually end up empty handed.